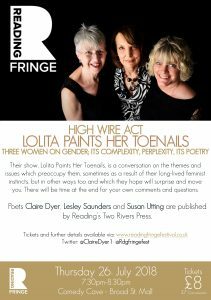 Had a brilliant time being part of last year’s Reading Fringe Festival along with Lesley Saunders and Susan Utting. 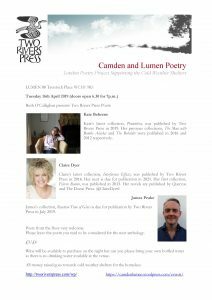 And am delighted to be part of this reading on 16th April. 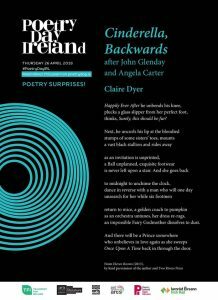 Am so grateful to Poetry Ireland for including my poem ‘Cinderella Backwards’ in their Poetry Day Poems on the DART campaign and what company I am in! DART commuters can enjoy great Poetry Surprises-themed poems on poetry posters across the DART fleet for two weeks from 23 April 2018, thanks to the generous support of Iarnród Éireann. If you’ve already spotted one, read more about it in our handy guide here by editor and broadcaster Niall MacMonagle. 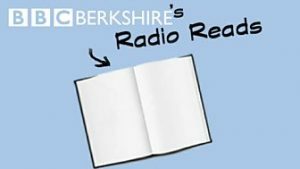 I love being part of Radio Reads with Bill Buckley on BBC Radio Berkshire! 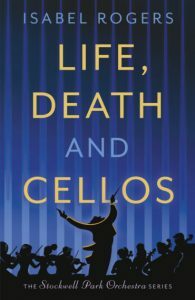 Our next book is ‘Life, Death & Cellos’ by Isabel Rogers and we’ll be chatting about it and making recommendations for May on Tuesday 7th May. The link for our April show is here from 1 hour 7 mins in. My co-Radio Reads chum, David Barker, has listed all our recent books on his blog here. It was wonderful being part of the judging team for last year’s awards but it was especially fab being part of the poem below. I was also honoured to be asked to take part in judging for the 2018 awards. 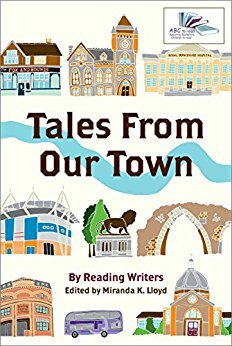 I am honoured to have work in Reading Writers’ latest anthology. This is available from Amazon, with profits going to the charity ABC to Read.